This web page is a transcription of an article by James Barbour written for the Society of Antiquaries of Scotland in 1907. By JAMES BARBOUR, F.S.A. SCOT. The one about to be noticed has, until lately, received the least attention, and is little known. It lies on the shore, in an angle formed by a small bay, half a mile westwards of the old graveyard of Kirkandrews. The country in the vicinity is comparatively flat, and generally there is a moderate declivity towards the shore. The surface, however, is singularly uneven and broken by hillocks of protruding rock covered with tussocks of grass which stud and mark the fields, particularly when under cultivation. Generally the shore is rockbound and rugged, and the land, owing to the rock formation, does not lend itself to the construction of earthen fortification, consequently the forts exhibit more or less stonework in their composition. 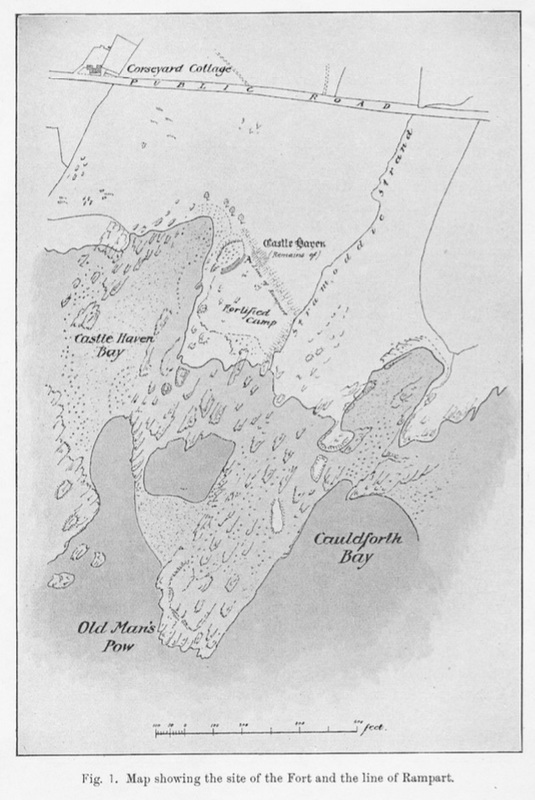 The Ordnance map surveyed in 1894, from which the accompanying map (fig. 1) is reduced; represents the prehistoric fort under notice as a small, oval-shaped area enclosed on the east by two parallel pieces of walling on the south-east side and a line of rock on the west, with the name “Castle Haven” imprinted in old English letters. 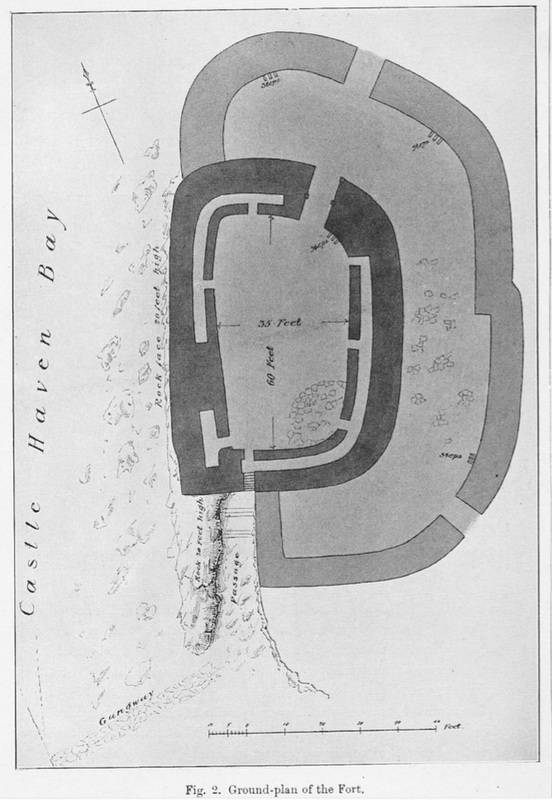 An important point, however, is that the whole promontory, at the north-west angle of which the fort is situated, is converted into a fortified camp (as shown on the map) by a line of rampart extending from the north-east side of the fort in a south-easterly direction for about 350 feet, then turning in a south-westerly direction for about 230 feet till it meets the shore-line. Mr Smith’s description is a correct one, and probably as full as the cairn like state of the ruin admitted. It may be added that, for an unknown length of time, it had been customary to obtain there stones for building dykes, road metal, and other purposes, a circumstance which accounts for the limited quantity of walling and stone debris remaining on the site. Alluding to this description, McKerlie, in Lands and their Owners in Galloway, says: – “To this castle it is believed that the Norse word borg, meaning a castle or fortification, was given by the Norsemen, and afterwards applied to the church and then to the whole parish.” The castle, however, really lies within the area of the ancient parish of Kirkandrews, but the name may have applied to the district prior to the time when the parishes were formed. 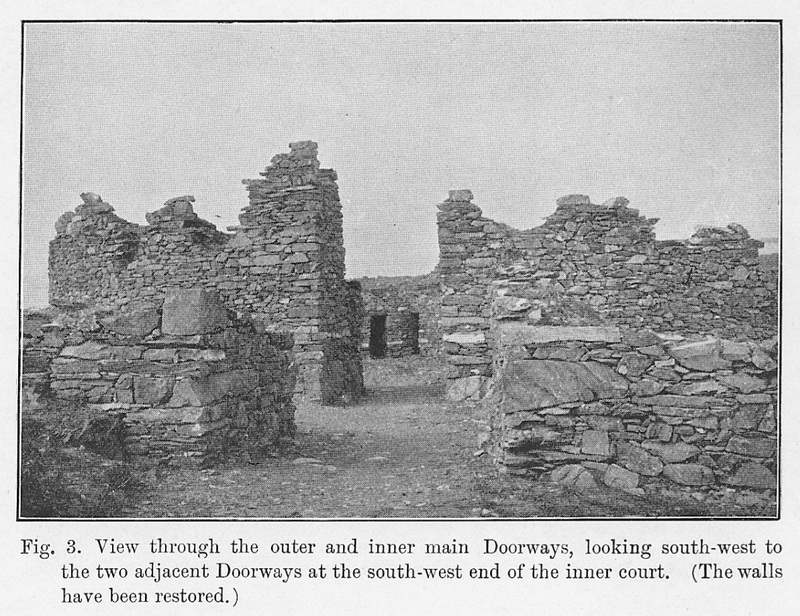 The ruin continued in much the same state as it was in Mr Smith’s time until last year (1905), when James Brown, Esq., of Knockbrex, proprietor of the land on which it is situated, undertook the clearing of the work, beginning in June and finishing in October, with the result that a structure essentially different in design and construction from what had been proved to exist in the district, has been revealed. The site of the castle as a place of defence is skilfully chosen on a bluff, at the neck of a very rugged promontory and is in part naturally impregnable. It stands 25 to 30 feet above Ordnance datum, is defended on the south by the sea and on the west by the head of the bay, and a perpendicular face of rock which rises from its margin to a height of 20 feet, receiving on its summit without offset or scarcement the wall of the superstructure. The superstructure, as will be seen by reference to the accompanying. plan (fig. 2), exhibits a central area or court. The court is begirt with a great wall, built of undressed native whinstone, put together without mortar or any cementing material. It is not solid, but contains cavities or galleries constructed within its thickness. Where the site is not naturally impregnable the defences are strengthened by an outer wall also built of uncemented stonework; and the space between the inner and outer walls forms an outer court. The plan is not symmetrical, being oval on the east part and nearly straight on the west, like the letter D. The irregularity is due to the exigencies of the site, the west part of the wall being built over, and following the line of the straight rock face of the site. In regard to dimensions, the central court measures 60 feet from south to north and 35 feet from west to east. The surrounding wall varies in thickness, being 15 feet at the north, 11 at the south, and 13 to 15 on the east and west parts. The main approach (fig. 3) is from the north or landward end, downhill, and straight through the north part of the wall, by a doorway 7 feet wide. At the east side of the doorway and the outer face of the wall there is an upright stone 12 inches square and 3 feet high, but no corresponding stone remains at the west side. Half-way through the wall there are two similar stones, one on either side of the doorway. These form checks, and it appears as if there had been two doors, one behind the other. Another doorway (fig. 4), 2 feet 6 inches wide, pierces the west end of the south part of the wall, and leads from the central court by a steep stone stair to the beach 12 feet below. Other doorways open from the central court, giving access to the galleries constructed in the thickness of the wall. These are, as they stand, three in number. One at the south end of the west part of the wall, adjoining the doorway leading from the court to the beach, measures 14 feet in length and 4 feet in width, with a doorway (fig. 5) 2 feet wide passing through part of the wall 2 feet 9 inches in thickness. Northwards, after 18 feet of solid work, there is another cavity, extending along the whole remaining west part of the wall and the north part on the west side, terminating with a solid division 5 feet thick between the end of the chamber and the main doorway. It measures 54 feet in length, the width being about 3 feet 6 inches; and two doorways, 2 feet 3 inches wide, passing through 2 feet 6 inches of the thickness of the wall, give access to the chamber, one being placed about the centre of the portion contained in the west part of the wall and the other near the centre of that contained in the north part. 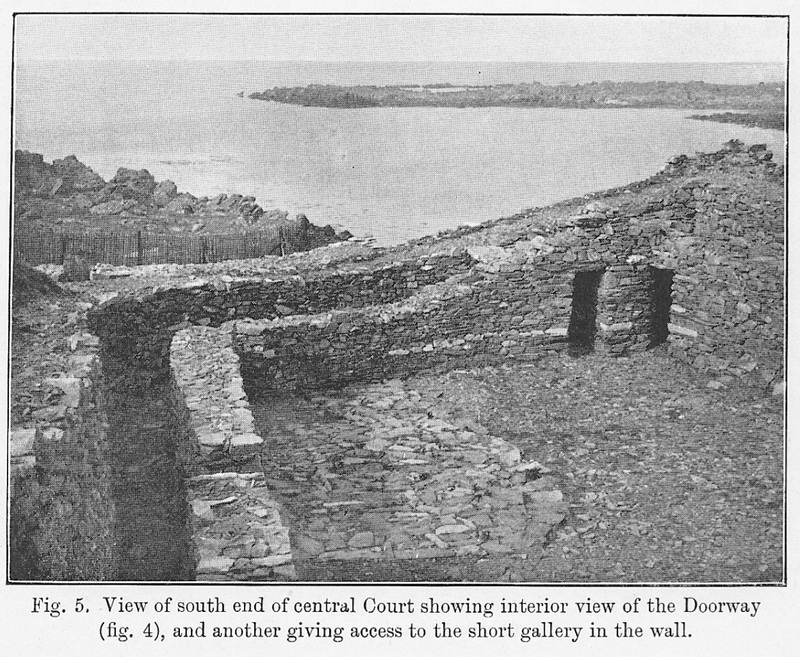 On the opposite side of the court there is one continuous chamber or gallery which begins 11 feet east of the main doorway, passes along the whole of the east part of the wall and the south part, and joins with an open end the south doorway leading to the beach. It extends to 80 feet in length, the width is 3 feet 6 inches, and in addition to the one leading to the beach, there are three doorways; one is placed at the north end of the chamber, one at what may be described as the southeast corner, and one midway between these. The doorways are 2 feet 9 inches wide and pass through part of the wall 2 feet 9 inches thick. Having regard to the regularity in the disposition of the doorways, it seems likely that the long cavities were divided so as every doorway would open on a separate chamber. In this way there would be six chambers in addition to the detached one in the south end of the west part of the wall, all of them on the ground-floor level. The wall from the main doorway eastwards, over a length of 11 feet, is solid. No remains or indication of stairs appear within the wall cavities, but provision is made in another form for reaching higher levels. Immediately east of the main doorway, steps project from the interior face of the wall, after the form of a “stile,” and these when complete would serve as a stair by which to ascend to the top of the wall; and probably there were within the central area more than one such stair. The outer court varies in width, the average being about 24 feet. The outer enclosing wall, which is solid and 10 feet in thickness at the north, varying to 8 feet at the south, starts from the north-west corner of the central structure where the high west rock face of the site ends, and after curving northwards it runs round the court in a curving line roughly parallel with the inner wall down to a point nearly opposite the south doorway, thence it returns at a right angle northwards and joins the south part of the central structure. 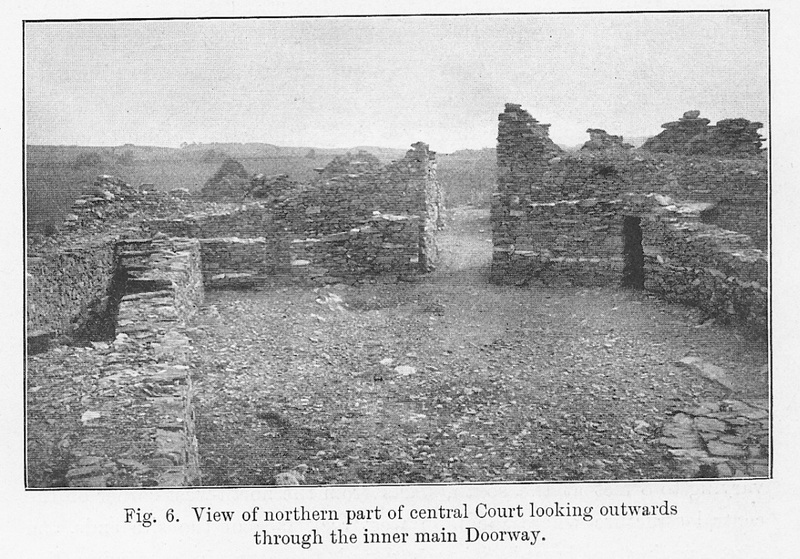 Two doorways pass straight through the outer wall: one is at the north (fig 6), opposite to and of the same width as the main doorway of the central court; the other is a few inches less in width and is placed at the south-east point of the court. Remains of three stairs consisting of steps projecting from the interior face of the outer wall, similar to the one in the central area, designed doubtless for ascending to the top of the wall, are found in the outer court. Certain arrangements connected with the small doorway mentioned as giving access from the central area to the beach, are of interest. Eight descending steps within the thickness of the wall and six outside lead to a passage having a fall seawards, 40 feet in length, 8 in width at the landward end, and 20 at the seaward end. From the seaward end a gangway about 4 feet wide and 50 feet long, constructed of large stones fitted together, runs in a south-westerly direction, and terminates at the side of the adjoining bay. The passage is flanked on the west side by a high and thin ledge of rock in continuation sea wards of that forming the west side of the site, and on the east by a low face of rock over which the return of the outer wall is carried up. The passage at the upper end appears to have been artificially formed by cutting out the rock between the two remaining ledges. The high, flanking sides render it unassailable, and it is not visible or approachable, except from seaward. Before passing from this part of the subject, note may be taken of certain restorations that have been made during the clearing of the remains, in order to guard against inferences being drawn from other than original work. The state in which the original work was found is as follows:- The wall of the outer court continued in good order to a height of from 2 to 4 feet, and the doorways were well marked. Of the wall encircling the central area, the north, east, and south parts stood from 3 to 4 feet in height with all the lines of the plan well defined. Of the west part, only the foundation remained in position, but in a state sufficiently perfect to clearly mark out the work. 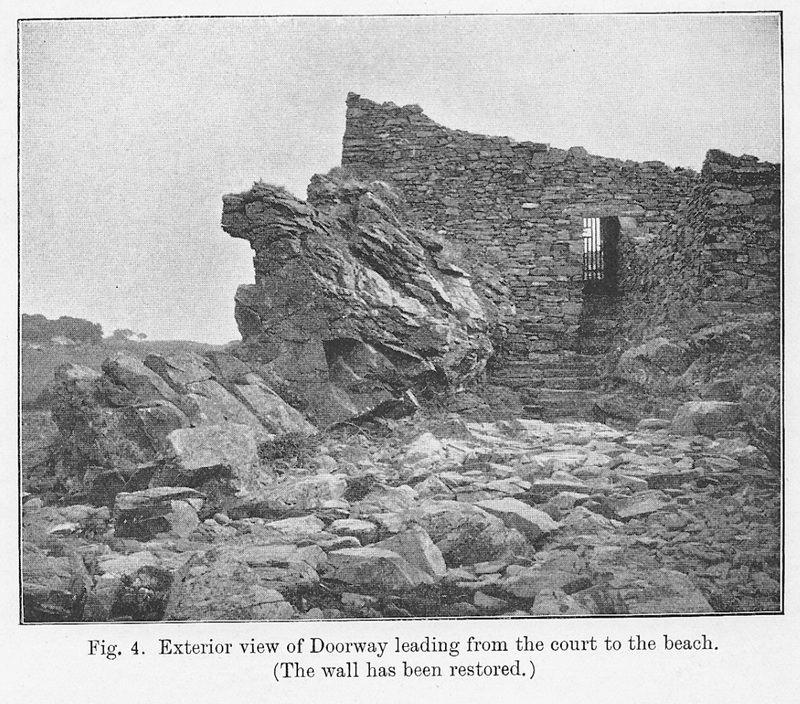 The restorations effected consist of heightening the walls by way or disposing of the stone debris, placing lintels over some of the doorways, covering parts of the wall cavities with flat stones, and inserting three stone steps into one of the cavities. The result has been to give prominence and tend to the preservation of the ruin, rendering it less liable to be trampled and destroyed than if left in the state in which it was when cleared. The relics recovered are few in number, and in character they correspond generally with the products of ancient sites. 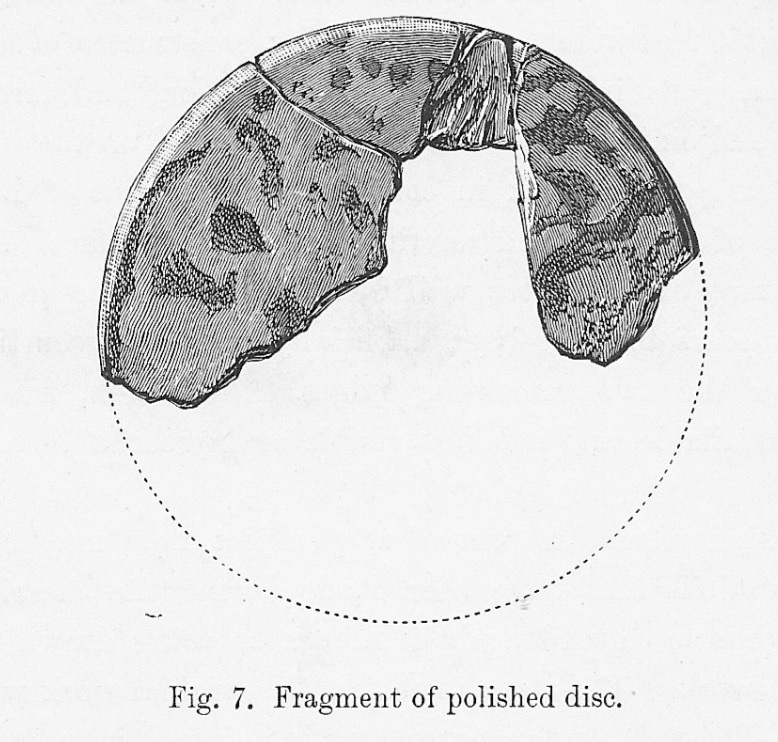 The fabricated articles consist of an upper millstone or quern and fragments of others; a water-worn stone with a broad, rounded end and pointed at the other end with sinkings on the sides; a cylindrical stone pounder and several whetstones; a rough stone disc 3 1/2 inches in diameter, pierced in the centre, the hole being worked from both sides by means of a point; a polished and holed stone disc, not quite circular, the diameters being 2 1/4 and 2 inches; a fragment of a polished disc (fig. 7), not quite 1/4 inch thick, the diameter about 3 inches; a burnisher 3 1/2 inches long, 1 3/8 inch broad, and 3/4 inch thick, rebated at the top end and pierced with a countersunk hole; a blue bead of vitreous paste (fig. 10) marked with a continuous wavy white line round the edge, the hole straight through the centre; a fragment of a ring bead of amber, the ring of circular section, decomposed outside; two spiral finger-rings of bronze wire (fig. 9), the ends loose; a bronze penannular brooch (fig. 8), the pin wanting; a quantity of small iron or steel rings about 1/4 inch diameter, partly interlaced, evidently remains of chain mail; and pieces of iron and charcoal. Of other relics a refuse-heap, at the south end of the central court, yielded a quantity of bones, fragments of deer horns of large size, and other food remains. In the course of the operations a human skeleton was exposed, but it immediately crumbled. It lay on the floor of the outer court, against the east wall of the central structure, the head southwards. The ring finger bone, still wearing a heavy iron ring, was gathered, and a number of human teeth. The occupants cultivated grain and carried it to the fort, where it was ground for use in hand mills or querns. They had cattle of different sorts, deer from the forest, and fish from the adjacent sea; a plentiful and varied fare. The fort does not appear, so far as the writer has been able to gather, parallel with any of the Scottish forts put on record. While the arrangements and structural characteristics exhibited go far towards an approach to the style of the northern Broch, there are several important divergencies and shortcomings. The points of conformity are that the walls are dry-built, of a usual thickness, contain central cavities, and are devoid of external openings except the doorways are external to the walls, contrasting with the short cavities on the ground fioor and the internal stairs of Broch. The chief difference, however, is in respect to the height. After making allowance for the removal of much of the material used in its construction, the fort could hardly have reached anything like the height of the Broch as it is described and characterised in works on the subject by Dr Joseph Anderson. The plan also, on account of its irregularity, does not lend itself to the idea of abnormal height. The types, however, seem too closely allied to admit of entirely independent origin. The fort may be said to stand to the Broch in the relationship of a one-storey cottage to a four-storey house; they are designed and well adapted to serve a common purpose, and the works, it may be conjectured, of different sections of a common race of men. There was a settlement of Celts from Ireland in Galloway, and the fort shows a remarkable resemblance to some of the cashels of that ancient race, whose traces are yet preserved in place and personal names of the district. With reference to the restorations of the walls of the fort alluded to on a previous page, it may be mentioned that the height to which they were found standing in the course of the excavations has been marked by a broad line of white paint, and a copper tablet, has been built into the restored wall, giving the date of the restoration. (1) Motes, Forts, and Doons of Kirkcudbright, by F. R. Coles.